Ollo is a new credit card issuer that was formed by former executives from Capital One and Bank of America. I also happen to know someone who works at Ollo and according to him, they are targeting consumers just below the prime market. They have just launched two credit cards and in this review, we will be looking at one of them, the Ollo MasterCard. 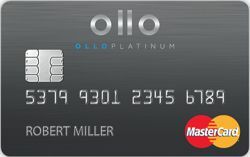 Ollo appears to be going all out to give consumers a card which no "gotchas". I commend them for this. But next, how does this really stack up against it's peers. Comparing this card at first becomes a little tricky simply because while at first glance it looks like a plain vanilla card, a look at the interest rate (APR of 24.99%) suggest that this card is targeting those people who are just below the prime market. This card appears to be for folks on the second stage of rebuilding and are probably at the "fair credit" stage. But first, let me looks at their features in more detail. The "no late fees" and "no over-the-limit fees" feature reminds me of the Citi Simplicity, which was perhaps the first card that came up with the concept of charge no late fees and no over-the-limit fees. While many airline affinity cards have no transaction fees, very few vanilla cards do. Only a select few like the BarclayCard Ring and the USAA Classic Visa do. Their "no return payment fee" is actually the first I have seen in any card. Many cards these days also give their card members access to their FICO score. For example even a "bad credit card" like Fingerhut gives you a free FICO score and so do prime cards like Chase Slate. Features aside, the cards we should be comparing the Ollo to are cards that are also targeting the same segment, ie to people who have fair credit and just below the prime market. Cards include the USAA Classic and Capital One Platinum and QuickSilverRewards. As you can see in the table above, in terms of features, the Ollo is clearly better than these cards as it has no annual fee, no foreign transaction fees and do not charge for other things like late fees etc. They also provide FREE FICO scores which their competitors do not and also claim to give you reviews for regular credit increases. However, they do not have any reward program, which cards like Credit One Bank and Capital One QuickSilver Rewards do. From my conservations with someone I know at Ollo, their interest rates and the late of balance transfer offer, it is clear that this card is targeted at people just below the prime market.In other words, it you have average credit from the mid to high 600s, this is just one of the cards you might want to consider. Folks at this stage of the rebuilding have probably been through a couple of secured credit cards, maybe a couple of high fee bad credit cards and maybe even a couple of no annual fee store cards. But at some stage, your purpose should be to get a no annual fee unsecured card that is either a Visa or MasterCard. If you are in this position, then the Ollo MasterCard is probably a card you would want to look at. It has the "no fee" features of prime cards, offers you access to a Free FICO score and also has a US based customer service. Many of it's peers charge and modest annual fee. A couple have reward programs that this card does not. However, if your credit is just below "prime", then this card is another great option to have in your rebuilding efforts.